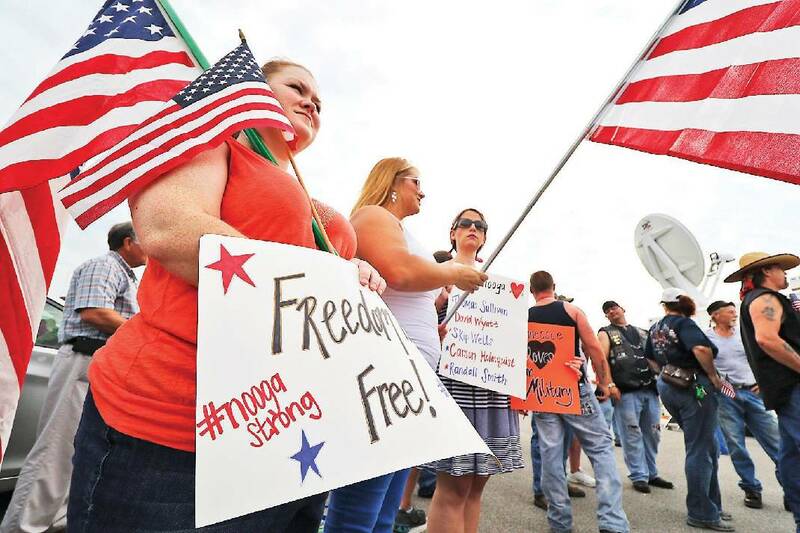 Christy Tucker, Morgan Mason and Lauren Lindsey, from left, wave flags and signs on Monday in front of the Lee Highway memorial set up for last Thursday's Chattanooga shooting victims. At first, just a few flags jutted out of the grass outside of the military recruitment office on Lee Highway. Later, someone added a few flowers. Then a cross, and a child's toy. POLL: Have you visited the memorial on Lee Highway? But by Monday morning, a sea of red, white and blue surrounded the perimeter of the strip mall where Mohammad Youssef Abdulazeez, 24, first opened fire on recruiters Thursday, before speeding to the U.S. Naval and Marine Resource Center on Amnicola Highway where he killed four Marines and a Navy petty officer. While a makeshift memorial also has sprung up near the Amnicola site, the Lee Highway strip mall has morphed into the destination for Chattanoogans who need to reckon with what happened Thursday. It is a place for people to quietly grieve, kneeling among the flags, wiping tears. It has become a place to express anger. "Arm our armed forces!" one sign demanded. Some in the crowd talked loudly about how President Barack Obama had not ordered the flags to half-staff or planned a visit to the area. The site also has become a place of pride — and protectiveness. Sunday night, rumors began to spread that Westboro Baptist Church members — the self-proclaimed church based in Kansas that has become known for its hate speech — would be coming to the site to picket against the members of the military who died. As the organization's Twitter claimed members were in Chattanooga, a counter-protest began to form over social media. Lauren Lindsey, a local teacher, texted with her friends Morgan Mason and Christy Tucker, and the three agreed to arrive early. They spent the evening before shopping for flags and making signs, and picked out red, white and blue outfits to wear. "I just felt punched in the gut," Lindsey said of the attack, adding that she hoped to "block out" any hateful messages from Westboro picketers. "A true American should love and support our military," she said. Some counter-protesters arrived as early as Sunday night. By 9 a.m. Monday, the parking lot was slammed with people waving American flags and patriotic posters. The crowd included Jeremy Newman, who also recently participated in local Confederate flag rallies. "We're all American," he said. "This is a way for me to show my gratitude to these men. If we have to build a wall to keep [Westboro Baptist] out, we will. We'll do whatever it takes." "It's a shame," added Sommer Rice. "The reason they have the freedom of speech is because these soldiers fought for that right." As it became clear the Westboro picketers weren't showing up, supporters said it didn't matter. They recited the Pledge of Allegiance, and played patriotic songs. "We're here first to show these families our support," said nurse Brenda Murray, who arrived from a 12-hour shift working at Parkridge East. "My heart just goes out to them." The Lee Highway strip mall also has become a place of recovery. As a Chattanooga Police officer rolled up yards of yellow caution tape, businesses around the recruiting center started flipping their signs from "Closed" to "Open." That included the U.S. Army recruiting office. While Army officials kept the doors locked, they maintained that they were still signing up recruits. Uniformed staff members remained busy at their desks — except for when they marched in formation to lay an arrangement of flowers at the memorial, to cheers from the crowd. The recruiting offices for the other branches of the military, which had sustained the gunfire, remained closed and boarded up. Military officials could not be reached for comment Monday about when or if those offices would reopen. Other business owners at the site said they appreciated the memorial, and supported plans for a permanent marker to be erected. But they also were hopeful that some level of normalcy would return so they could recoup from four days of lost business. Sunny Hubbert, owner of Foil Salon, said she would open today. She is still trying to process what happened Thursday, she said. After hearing the first shots, she initially ran outside to see what was going on, assuming it was some kind of drill. There, she saw the silver Ford Mustang pulled up next to the recruiting office, and Abdulazeez in the driver's seat, holding a rife and "focused," she recalls. She ran back inside as he continued to spray bullets into the windows, then he pulled out of the parking lot and onto the highway. A group of three military members were sprinting after him, she said. It would only be later that Hubbert knew the whole story, about the deaths and a terrorism investigation. "I am still emotional. It never crossed my mind something would happen here," said Hubbert, who lived in New York when 9/11 happened. "I guess there's no such thing as a safe place anymore." For military veterans, such shock can trigger memories of old trauma. That is why, across the parking lot, the Veterans Affairs Mobile Vet Center set up shop. Inside the large trailer, professionals will provide psychological counseling for any military veterans or their families. As the heat began to settle over the parking lot, volunteers passed out water to the crowds. Cleveland Tent Co. arrived with a large truck, and soon pitched two large white tents to protect the memorial from the elements. While the show of support has been largely peaceful, there was one flare-up Sunday evening. A Madisonville, Tenn., man was arrested Sunday after he called a police officer a racial slur and "preached" loudly at the crowd from a curb, causing the crowd to "react very negatively," according to his arrest affidavit. Four four hours, James Hutchins, 60, paced the property, shouting, yelling and arguing, shouting words such as "boy" and "queer" at people in the crowd in an attempt to get some sort of response, the affidavit states. At one point, Hutchins and another person got face-to-face and police had to ask the pair to separate, according to the affidavit. During the confrontation with police, Hutchins called a black officer a racial slur, which caused a stir in the crowd, police said. The crowd began to close in on Hutchins and police took him into custody. He was charged with inciting to riot and disorderly conduct. Many in Monday's crowd said they didn't have patience for such discord, including five men standing together with giant white posters. One, a self-proclaimed Baptist, held a poster with a Bible verse warning against false apostles. Another, an atheist, wrote "I'm an atheist and I'm a better Christian than you" on his. They were "bonded together by tragedy," they said. "[Westboro Baptist] needs to know we're here in force for the same cause," said Jason Hulsey. "We've got atheists, Christians, straights, gays, black, white — everyone you can imagine out here for the same cause. And they need to see that."